The quality standards for our vehicles are exceptionally high. That’s why finding outstanding individuals for our Automotive Service careers is so vitally important. Those who join us in this area are able to deliver both outstanding customer service and automotive services. With business growing every day, we have a variety of opportunities for individuals with technical automotive skills, and for management professionals. Find out more about the careers that are available. 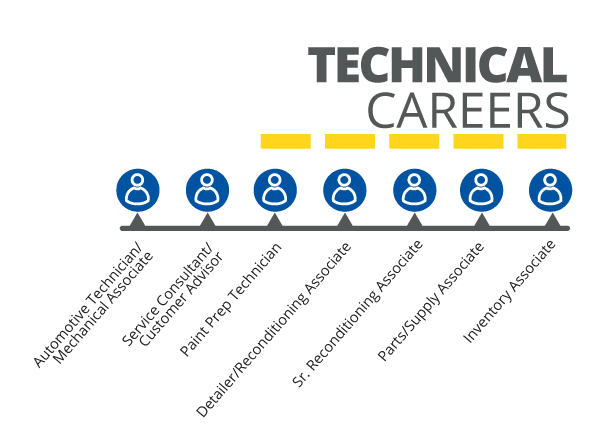 See what being a CarMax Auto Technician is all about! You’ll experience the best settings in the industry: modern, clean, well equipped, climate-controlled, with state-of-the-art tools and technologies. You’ll experience a workplace full of opportunities for skill development, award-winning training, advancement, and recognition for your performance. If you are currently attending an Automotive Trade school, visit our Trade School Recruiting page. Our Auto Technicians are experts at reconditioning, diagnosing, and repairing all makes and models of cars. But that’s just the start. They are honest, enthusiastic, team-oriented, and committed to the highest quality performance. Search Service Consultant/Customer Advisor jobs or Service/Customer Operator jobs now. Responsibilities include scheduling repair appointments, greeting customers in service lanes, generating estimates, writing repair orders, and following up with customers. Under general supervision, you will deliver exceptional customer service by acting as a liaison between the customer and retail technician or mechanical Associate on the phone before, during, and after the service/repair processes. Responsibilities include performing minor repairs to metal and plastic as well as preparing vehicles for painting. Training is offered to qualified individuals who would like to learn a new skill, leading to a career in paint and body repair. You will effectively and safely operate sanders, grinders, and paint guns as well as other tools, equipment, and products used in paint and body operations. Paint Prep Technicians must be familiar with the use of paint mixing and drying equipment plus OSHA safety standards. Performing vehicle damage assessment is also required in this position. The Detailer/Reconditioning Associate will work as part of a larger reconditioning team and will train to perform automobile receiving, inventory scanning, vehicle movement (both on and off lot), and vehicle delivery preparation while providing superior customer service. Duties include, but are not limited to, basic vehicle detailing including car wash; interior cleaning and vacuuming; exterior cleaning of CarMax used, new and customer vehicles. The Senior Reconditioning Associate works as part of a larger reconditioning team, with each Associate completing a set of standardized activities. Duties include ensuring all vehicles meet CarMax cosmetic standards, and completing all aspects of the cosmetic vehicle reconditioning process, including masking, sanding, grinding, paint application, removal and replacement of parts, plastic and substrate repairs, paintless dent repair, and post-paint refinish and defect correction. The Senior Reconditioning Associate will also be responsible for inventory and detailing duties on an as-needed basis. Parts/Supply Associate responsibilities include scheduling repair appointments, greeting customers in service lanes, generating estimates, writing repair orders, and following up with customers. Under general supervision, you will assist Technicians with determining part numbers, locating parts, receiving parts into inventory, distributing parts to customers, properly documenting transactions, returning parts to vendors, conducting inventory control and maintenance, and ensuring OSHA/EPA compliance. Under general supervision, this position will ensure the daily maintenance and security of display areas and work-in-progress zones; prepare vehicles for delivery to customers; check-in and receive vehicles that are shipped to CarMax; complete the daily scanning and reconciliation of vehicle inventory; ensure that all vehicles meet CarMax Final Quality Standards; drive vehicles to and from various locations as requested by supervisor; and provide outstanding customer service at all times. Responsibilities of a Parts Manager include maintaining parts inventory for all types of vehicles including stock, daily, and special orders, as well as controlling aging and shrinkage. Parts Managers assign parts to a vehicle stock number or RO, maintain vendor relations and hazardous disposal logs, and monitor quality and costs of parts. Parts Managers also assist in the hiring and performance management of Inventory Associates. Cosmetic Supervisors are responsible for supervising Detailers, Reconditioning Technicians, and Painters. Additional responsibilities include completion of cosmetic inspections on all vehicles to be reconditioned, achieving optimal vehicle flow through assigned work zones, maintaining CarMax cosmetic quality standards on all reconditioned vehicles, and ensuring both high quality and production efficiency for the store’s Cosmetic Technicians. Service Managers are responsible for managing an auto service operation with maximum customer focus and efficient, high-quality repairs while supervising a team of Technicians and Service Consultants. Additional responsibilities include managing sublet vendor processes and warranty administration; mentoring and training Service Consultants; monitoring and managing CSI and FIR to be within company guidelines; and resolving customer issues that relate to service. The Service Manager will also assist in the hiring process and performance management of Service Consultants, Technicians, and Warranty Administrators. Reconditioning Production Managers are responsible for supervising Inventory Associates, Recon Technicians, and Cosmetic Supervisors. Additional responsibilities include maintaining the integrity of the store’s vehicle inventory; optimizing vehicle flow through WIP (i.e., cycle time); achieving newly saleable targets, and CarMax quality standards on the display lot; ensuring both high quality and production efficiency for the store’s Cosmetic Technicians; and performing the duties of an Operations Manager in his/her absence. Production Managers begin in training, benefitting from an extensive hands-on program that includes cross-functional training in several areas of operations. Production Managers manage and lead Associates in our high-volume used car reconditioning operation and profitable retail service operation. Additional responsibilities include achieving production targets, resolving Associate and customer issues, and ensuring compliance with OSHA, EPA and risk management rules and regulations. 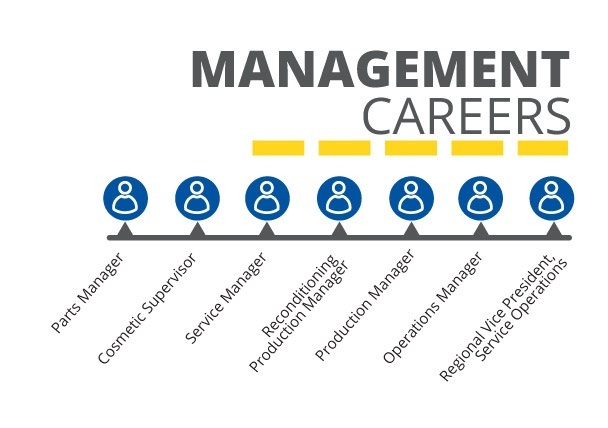 Operations Managers begin by completing an extensive training program that includes on-the-job store rotations in several areas of store operations. Operations Managers are responsible for the overall success of the Operations Department, and for developing a team of Managers. Additional responsibilities include achieving financial and operational targets for all aspects of store operations, providing high customer satisfaction, resolving Associate and customer issues, and ensuring compliance with OSHA, EPA and risk management rules and regulations. Regional Vice Presidents are responsible for the operations of multiple locations within a specific region. This position is filled internally by a successful CarMax Operations Manager.